One of several companion cards for the Latin Mass, we offer an easy to read set of Latin Prayers At The Foot Of The Altar. Printed on card stock, each card measures 8.5 x 11 inches. An English version is also available. See the English sub-category: Companion Prayers. This is our easy to read Benediction Prayer card for the Latin Mass. There are two columns for both Latin and English. To keep the type as large as possible, graphics were omitted. Printed on card stock, each card measures 8.5 x 11 inches and is available as a print or laminated. This one-of-a-kind card contains those center altar card prayers said during Mass that are difficult to read from the vertical center card while the priest is bowing. 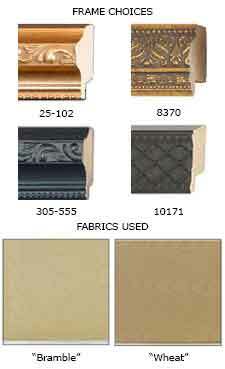 It is designed to be laid flat on the altar and easy to reference. The print is a large 14 point font. Although technically optional, having this card on the altar makes saying Mass much easier. A priest phoned and asked me to design this for him and other priests. Very practical addition to any Tridentine Latin altar card purchase. 8.5 x 11 inches. Laminated. 4. Latin High Mass Incensing Prayers "Roman Pillars"
One of several companion cards for the celebration of the Latin Mass, we offer this special card containing the three Incensing Prayers for celebrating High Mass. 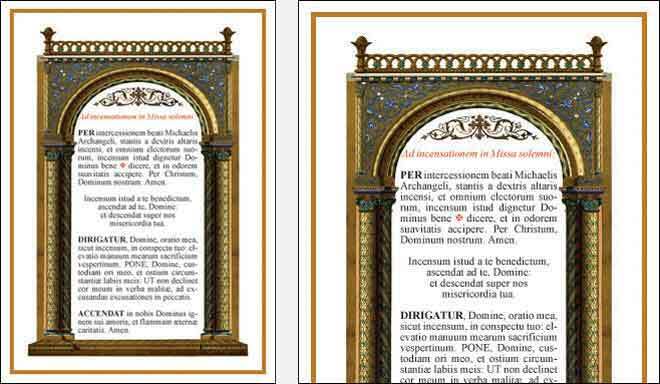 It features the beautiful artwork of our "Roman Pillars" altar cards and the type is an easy to read, 12 point font. With this card lying flat on the altar, a priest can use his regular Low Mass altar cards to say High Mass. 5 x 7 inches. By request, we have designed our version of a nice two-sided "Asperges Me / Vidi Aquam" prayer card with Latin notation and diacritical marks for the Roman Catholic High Mass. The "Vidi Aquam" is on the reverse side. This notation design is versatile enough for both the priest and the choir to use. It features large, easy to read, 12 point type with the same artwork that we created for our "Prayers At The Foot Of The Altar" card. Letter size, 8.5 x 11 inches.